Ryu: “I’d like some pound cake”. 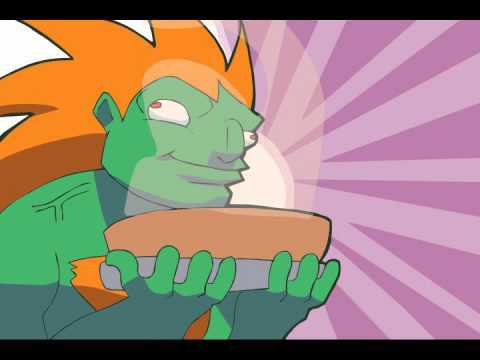 Ever since Street Fighter aficionado Pete sent me this Blanka Makes Pound Cake YouTube video the other day, I’ve thought of little else but pound cake. Suffice to say, the joke only works if you’re familiar with Ryu’s Hurricane Kick sound effect from the Street Fighter games – which I am, it being one of only about five games that I’m able to play with any kind of socially acceptable dexterity. 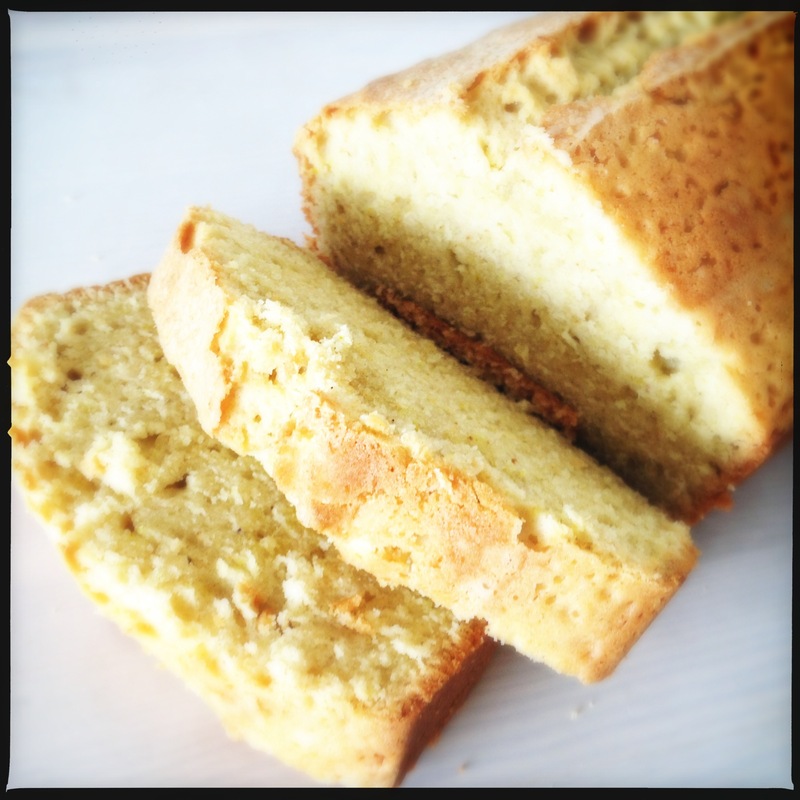 Just in case you’re not schooled in the ways of baked goods, pound cake is popular in the US, particularly the south. The traditional recipe calls for a pound each of sugar, butter, flour and eggs, hence the name. Incredibly, 4 March is National Pound Cake Day in the US. The fact that this particular version as got turmeric in it sounds a bit weird and gives it a slightly yellow colour, but DON’T PANIC. I can assure you it’s very pleasant with a tasty cup of tea (or coffee, if you insist). Preheat the oven to 160°C /140°C (fan oven)/325°F/Gas mark 3. Grease and line a loaf tin with greaseproof paper. Cream the sugar and butter together in a big bowl, using a fork. Once it’s all mixed together, add the eggs one at at time, mixing each one in as you go. Add the rest of the ingredients and mix well. Dollop the whole lot into the tin and smooth over the top with a spatula. Bake for 1 hour and 10 mins, or until a skewer inserted into the centre comes out clean (my oven took about 1 hour 20 minutes). Once it’s out the oven, leave in the tin for about 10 minutes then turn onto a wire rack to cool. Game Over. 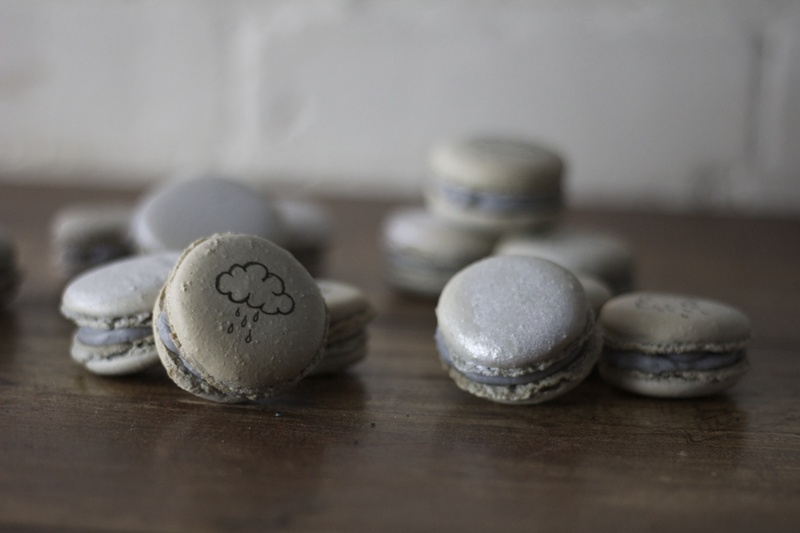 The Depressed Cake Shop is a pop-up shop that aims to raise awareness of depression and well as making some cash for a mental health charity in the process. All the baked goods in sold in the shop will be grey on the outside. The first shop will open on 2 August in Brick Lane, London, with plenty more pop-up shops planned all over the country. The project is also set to go global, with bakers already lined up in the US, Australia and Malaysia. 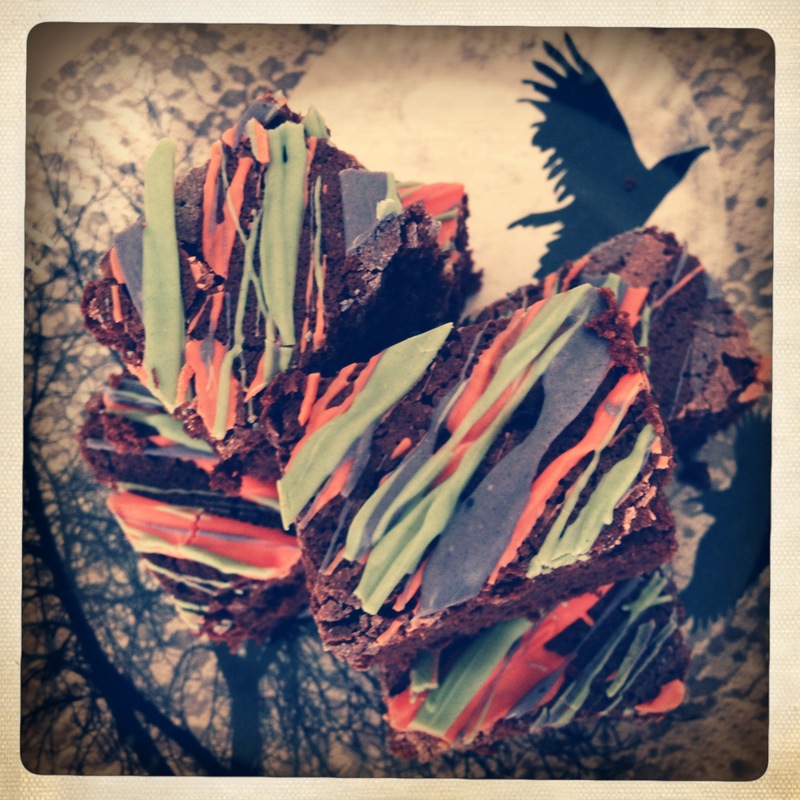 The splendidly grey-tinged, fundraising idea is the brainchild of Miss Cakehead, who’s previous projects include the gruesome Eat Your Heart Out shop for Halloween, the Katy Perry-themed Cakey Perry afternoon tea and the Cakes for Japan shop which raised money to help rescue efforts following the 2011 tsunami. 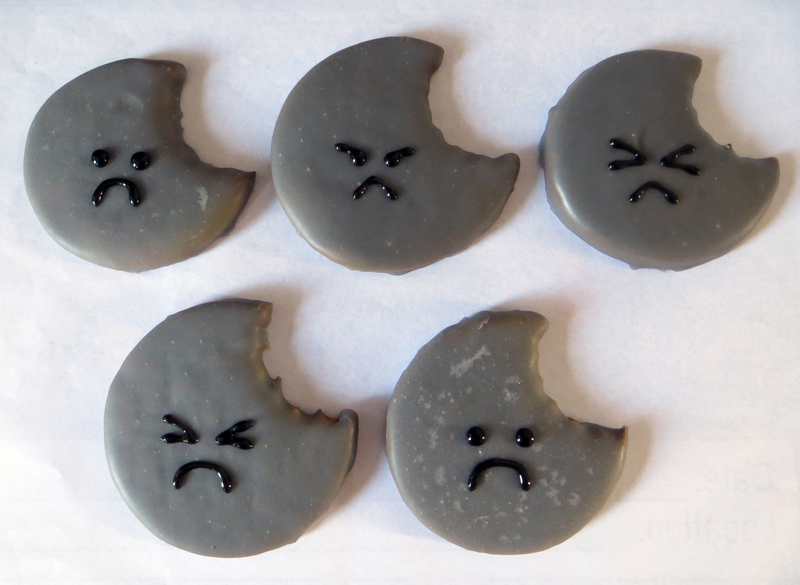 Among other things, the Depressed Cake Shop will be selling Gloomy Grey Lemon Macarons from Dainty Bakehouse, Misfortune Cookies from Miss Insomnia Tulip, and Life’s Taken a Bite Out of Me Biscuits from Laura Fortune. It’s been a while since I’ve had any spare time for preposterously themed baked goods, but fear not – it’s a bank holiday here in the UK and while everyone else is out in the sun, I’m spending some quality time in my kitchen because I know how to have a good time. Yes, sir. Star Wars Day (‘May the 4th be with you…’) seemed like a good time to pick up the Darth Vader spatula again. This isn’t the first time time I’ve employed Star Wars as a theme for confectionery – I’ve previously made Star Wars Holiday Special cupcakes, Star Wars shortbread and Han Solo in carbonite chocolates to name a few. This time? I’ve gone one better and gone for a May the 4th/Cinco de Mayo mash-up. The result? 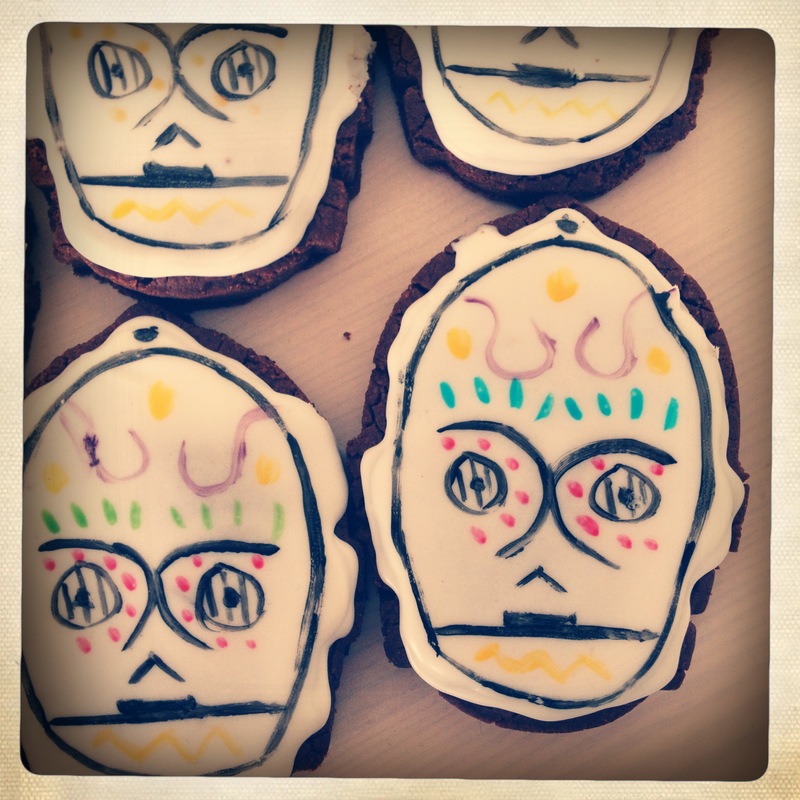 C-3PO Sugar Skull Chili Chocolate Biscuits. You heard. 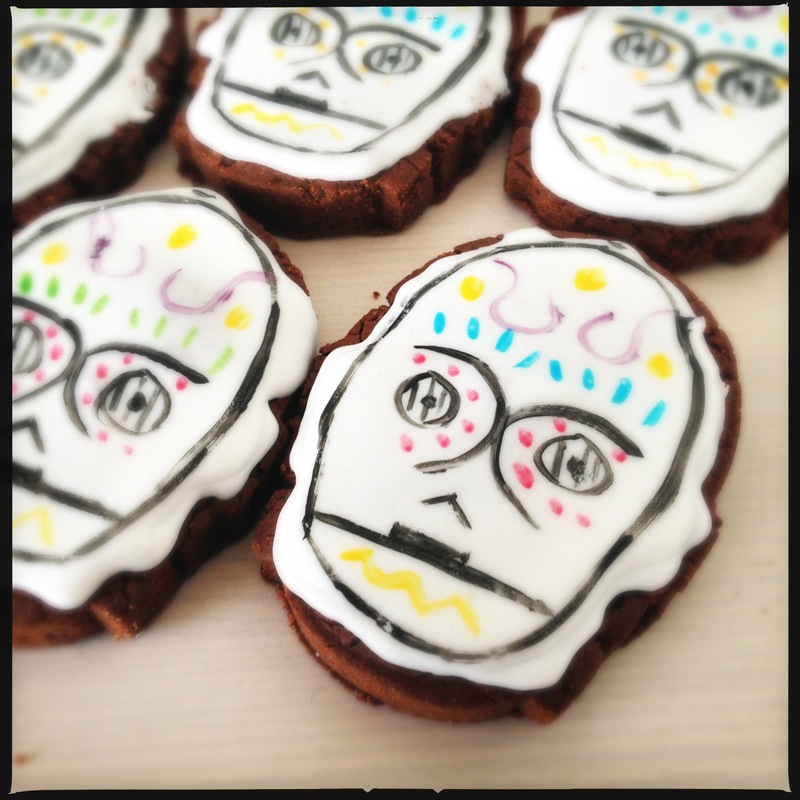 Obvisouly the sugar skulls are usually linked to the Mexican Day of the Dead festival (Dia De Muertos) on 1 and 2 November, rather than Cinco de May (on 5 May), but why let the facts get in the way of a good biscuit, eh? 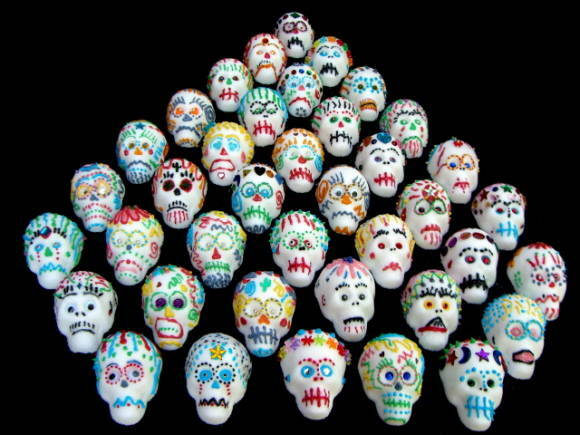 (On a side note – did you know that Mexico has a festival with the unimprovable name of Night of the Radishes? You do now). Back to the biscuits (or cookies, if you’re of the American persuasion). I adapted the the Super Chocolatey Biscuits recipe from the Biscuiteers Book of Biscuits and followed their guidelines for icing. The whole ‘line’ and ‘flooding’ icing system is a bit of a palaver, and a process that I’ve only used twice before on my peanut butter plectrum biscuits and Kendo Nagasaki biscuits, but it does give a good result. 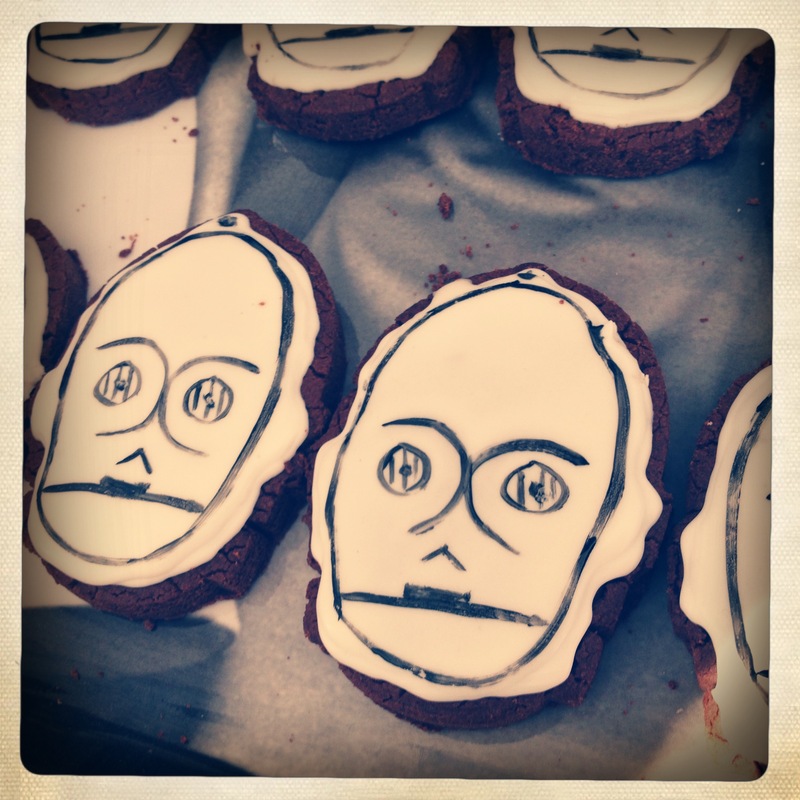 I used one of my three (yes, three) sets of Williams Sonoma Star Wars cookie cutters to cut out the C-3PO faces, but you can always but them out with a knife. Mix the sieved flours, cocoa powder, sugar, chili powder and cayenne pepper into a large mixing bowl. Add the butter and use your fingertips to rub the ingredients together until it looks like fine breadcrumbs. Next, make a well in the middle and add the egg and golden syrup and mix together into a dough. Add a touch more golden syrup if it’s too dry to form a dough. Divide into two or three balls, squash flat into large discs, wrap in clingfilm and bung in the fridge for an hour or so. When you’re ready to roll, bring the dough back to room temperature and place a disc between two pieces of baking parchment and roll out with a roling pin. This means that won’t need to add any flour to stop the dough from sticking. The dough should be about 5mm thick. Cut out your shapes and place them a fair distance apart on a non-stick baking sheet. Stick in a pre-heated oven on 170°C (150°C fan oven)/350°F/gas mark 4 for about 14-16 minutes. Then take them out of the oven and carefully transfer to a cooling rack. Make sure they’re completely cool before you start to ice them or the icing won’t stick. Bung the water in a large bowl, then add 450g of royal icing sugar. Then whisk them together until the icing is the same sort of consistency as toothpaste. If it looks too runny – add some more icing sugar. (I ended up using the whole 500g). I added a a few drops of icing whitener at this point. Stick a tablespoon or two into a disposable icing bag and snip of the end to make a small hole. Pipe the outline of the face around the edge of the biscuits, forming a tiny wall of icing with no gaps. Let dry for five minutes. Next you’ll need to convert the remaining icing in the bowl into flooding icing. To do this, add a few drops of water at a time and mix in until the consistency is slightly runny, a bit like custard. Spoon carefully into the middle of each biscuit and smooth out to the edges using the back of the spoon or a cocktail stick if you want to be precise. Leave to dry for a while. Next, paint on the C-3PO face. I used some coloured icing gels that were kindly sent to me the nice people at Dr Oetker. I stuck a blob of each colour onto a makeshift baking parchment palette and used a fine paintbrush to draw on all the details. I have no painting or drawing abilities whatsoever, so the finish isn’t perfect, but it’s the best I could manage with my ham-fisted artistry skillz. The last step is to return the iced biscuits to a very cool oven – about about 50-70°C/120-160°F/gas mark1/2-3 for 30 minutes. I know it sounds bonkers, but it dries out the moisture that seeps into the biscuits from the icing and restores the crunchiness. Not content with cobbling together a Spotify Christmas playlist, and turning my flat into a cut-price winter wonderland with the aid of two pieces of tinsel and a preposterously tiny Christmas tree, today I attempted to get into the festive spirit by making some gingerbread zombies. ‘Gingerdead Men’, if you will – inspired by Zombie Christmas – the new yuletide tune from Emmy the Great and Ash’s Tim Wheeler (video below). Fancy making your own? Of course you do. It’s not hard. All you’ll need is a gingerbread man cutter and the simple recipe below. 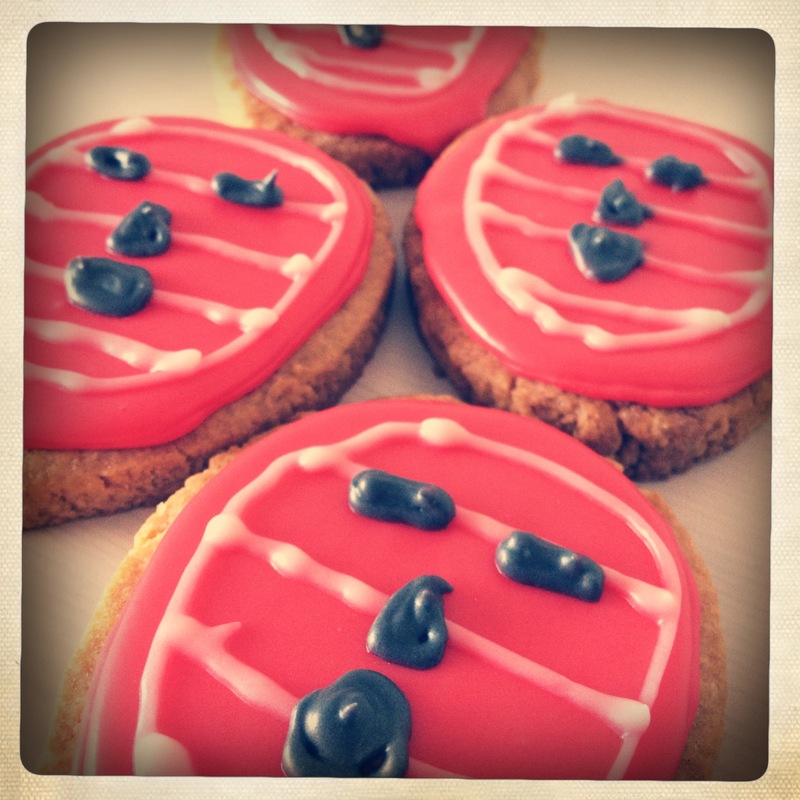 Obviously you can decorate your biscuits in any way you see fit, but I chose to make mine into zombies. I clearly had too much time on my hands today as I made some into scared-looking gingerbread men as well. Then I took pictures of the zombie biscuits stalking and eating the scared gingerbread man. A cry for help, some might say. Combine the flour, bicarb and ginger in a big mixing bowl then throw in the butter and rub the mixture together with your fingertips until it looks like fine breadcrumbs. Next, mix in the sugar. In a different bowl, whisk together the egg and the golden syrup then pour into the flour mixture. Use your hands to form the ingredients into a dough, adding a small of amount of flour if it feels a bit too sticky and not-very ‘dough-like’. Divide the dough into two large blobs and flatten into discs. Wrap them in clingfilm and bung in the fridge for at least an hour. Preheat the oven to 190°/170° (fan oven)/375°F/gas mark 5. Roll out the dough between two sheets of baking parchment. This should prevent it from sticking and means that you don’t have to add any more flour. Roll out to a thickness of about 4mm and cut out your shapes. Place on a lined baking sheet (leaving plenty of room between each biscuit) and stick in the oven for 12 minutes until the biscuits begin to turn golden brown at the edges. Leave to cool on the baking tray for about five minutes before transferring to a wire rack. Wait until the biccies are completely cool before you start icing, or it won’t stick. I used pre-bought icing tubes for the decoration, or you can make your own royal icing if you prefer. Update: Tim Wheeler from Ash says these are “amazing!”. Oh yeah. Eat Your Heart Out 2012 was the latest project from Miss Cakehead, whose previous projects include the kitsch Cakey Perry afternoon tea and Cakes for Japan – a cake-based series of fundraising events to raise money for victims of the 2011 tsunami. 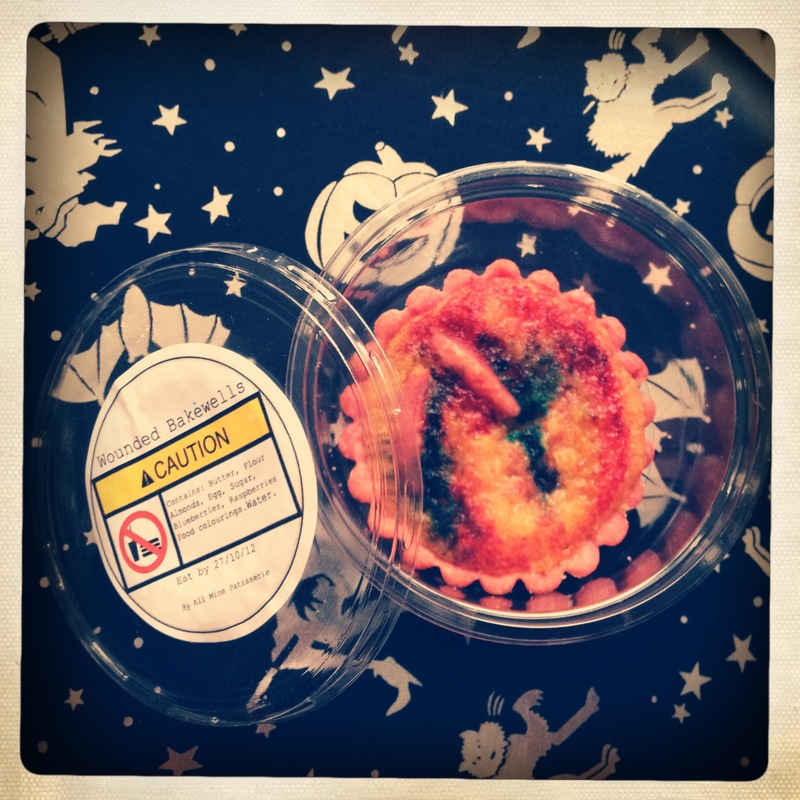 I went along to Eat Your Heart Out 2010 – the world’s first 18+ cake shop, so I as soon as I got word of Eat Your Heart Out 2012, I stuck it in the diary and booked my (free) ticket) faster than you can say “make mine a polycystic ovary cupcake”. 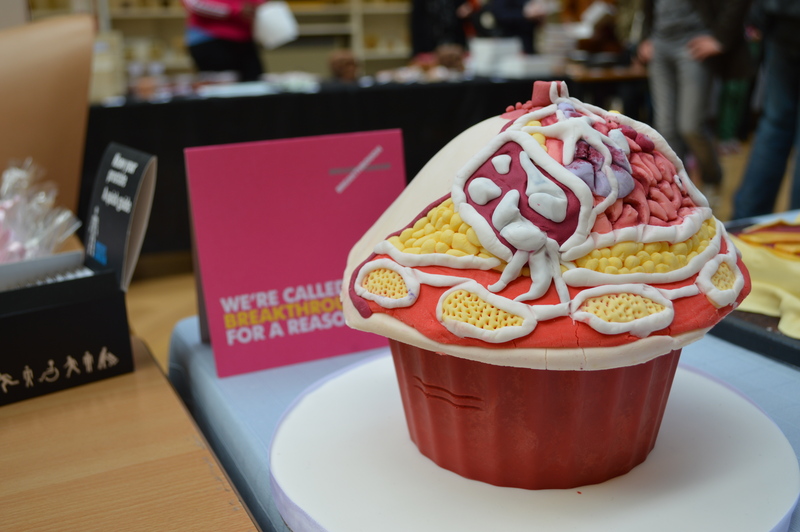 The EYHO pop-up shop was open for three days over the weekend before Halloween with the pathology museum at St Bart’s hospital in London providing the perfect venue for the macabre cake sale. 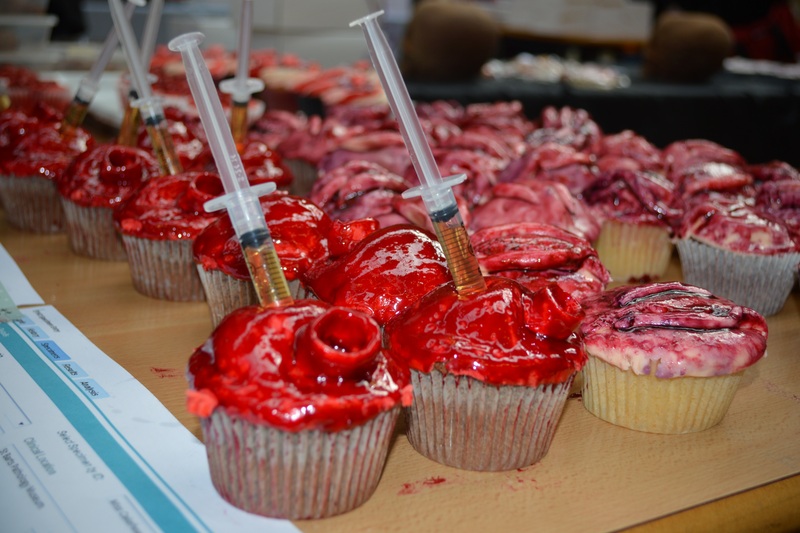 The gruesome treats on offer included aorta cupcakes (with rum syringe shot!) 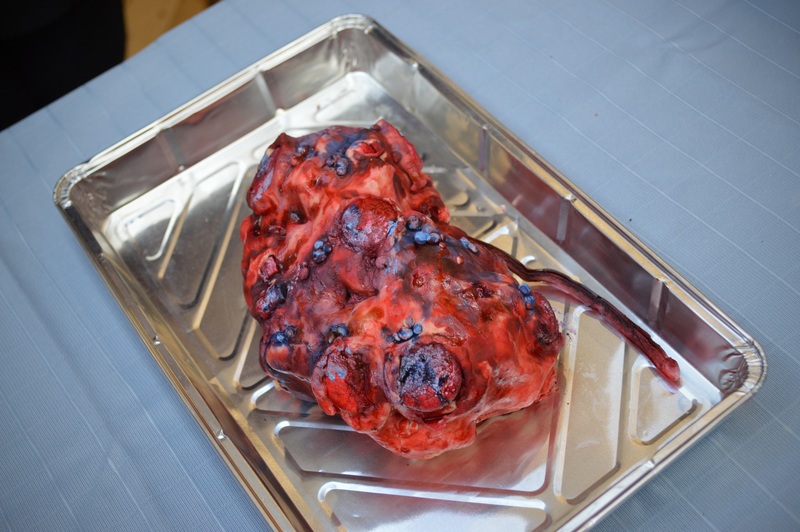 from Leshie Loves Cake, lung cancer cookies from Nevie Pie Cakes and polycystic kidney cake from Cakes by Victoria. You can check out the full EYHO 2012 menu here. 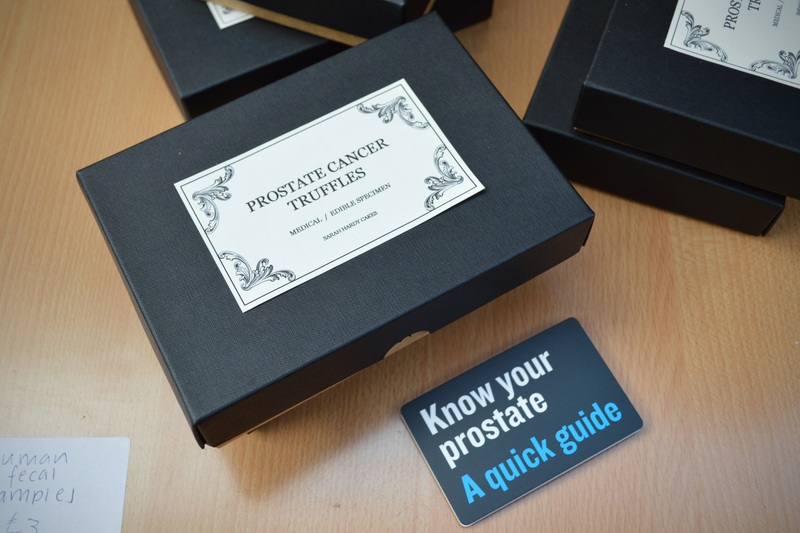 While designed to shock, the baked goods also carried a serious message, many of which were displayed to raise awareness of the conditions that they represented, like the prostate cancer truffles and mole cupcakes. It’s testament to the artistry of some of the bakers involved that their cakes simply looked too horribly realistic to buy. 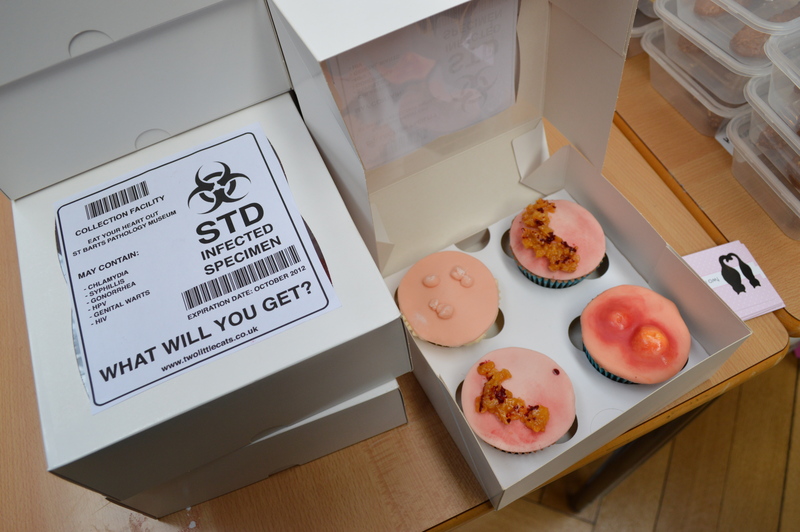 While I appreciate the edginess of the STD cupcakes, stool sample cakes and limoncello cocktails disguised as urine samples, I simply couldn’t bring myself to try them (although I’ve no doubt that they were very tasty). 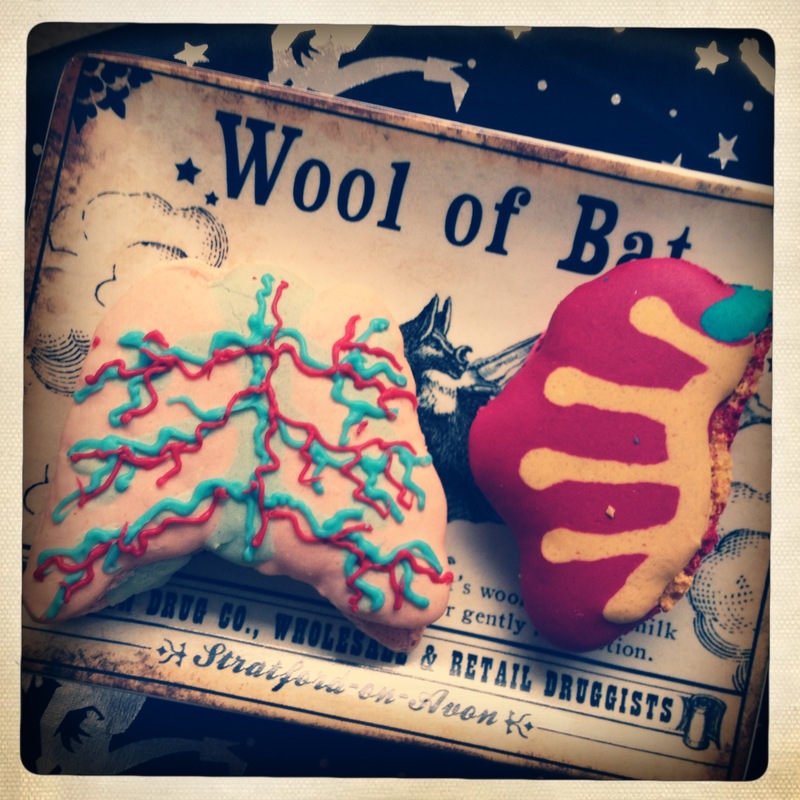 Instead I opted for some macarons shaped to look like internal organs (kidneys and lungs) from Miss Insomnia Tulip and a ‘wounded bakewell’ from the All Mine Patisserie. As you do. It’s nearly Halloween! 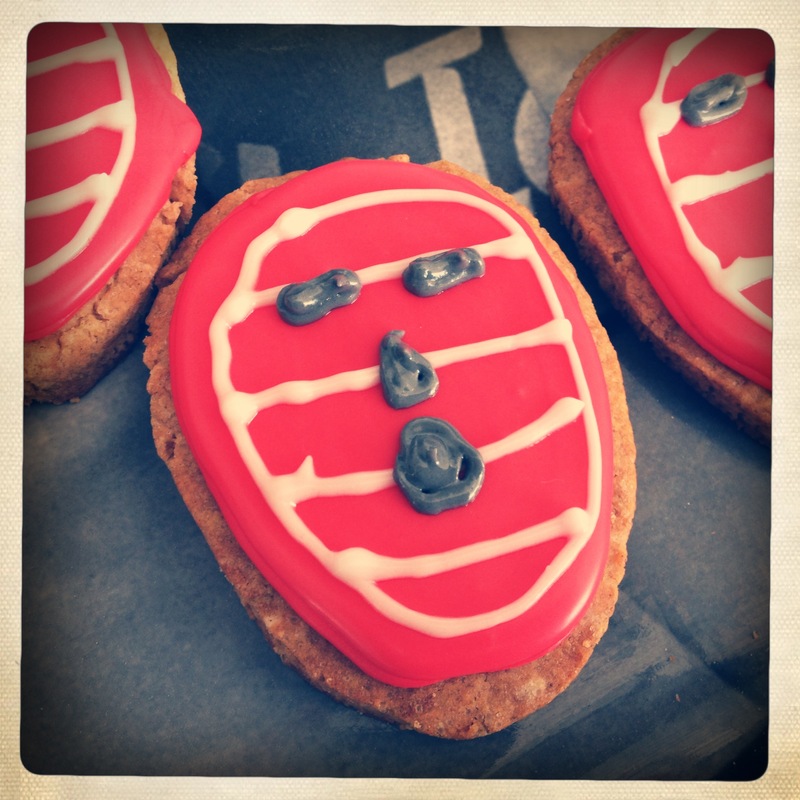 Like any other time of year on London Baking, that means tenuously themed baked goods. 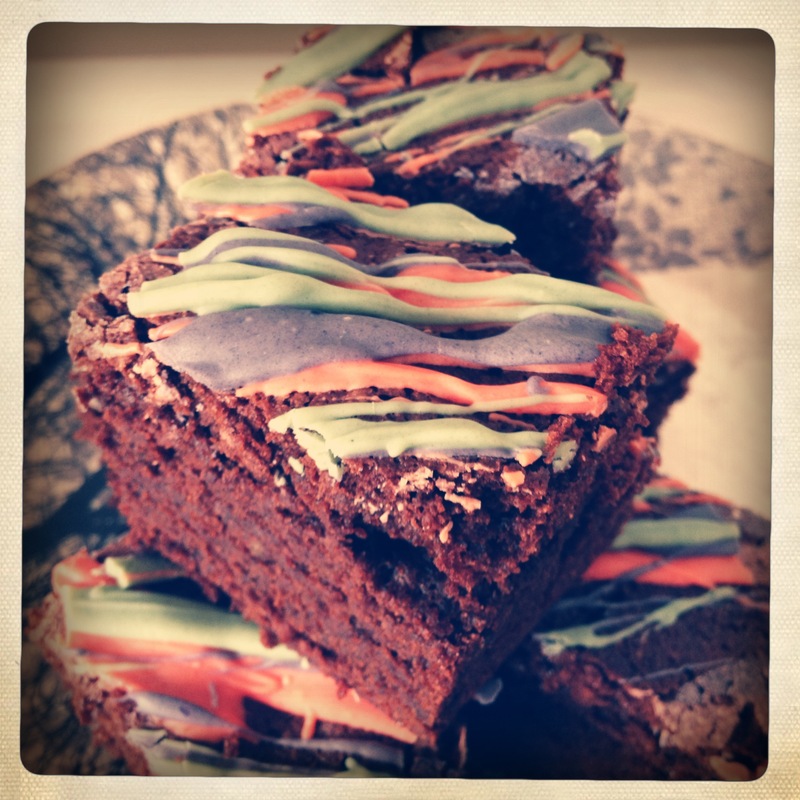 This cakey creation is based on my usual brownie recipe with a colourful twist. Without wishing to sound too much like an utter ponce, the colours of the toppings were in fact inspired by a painting (pretentious? Moi?). 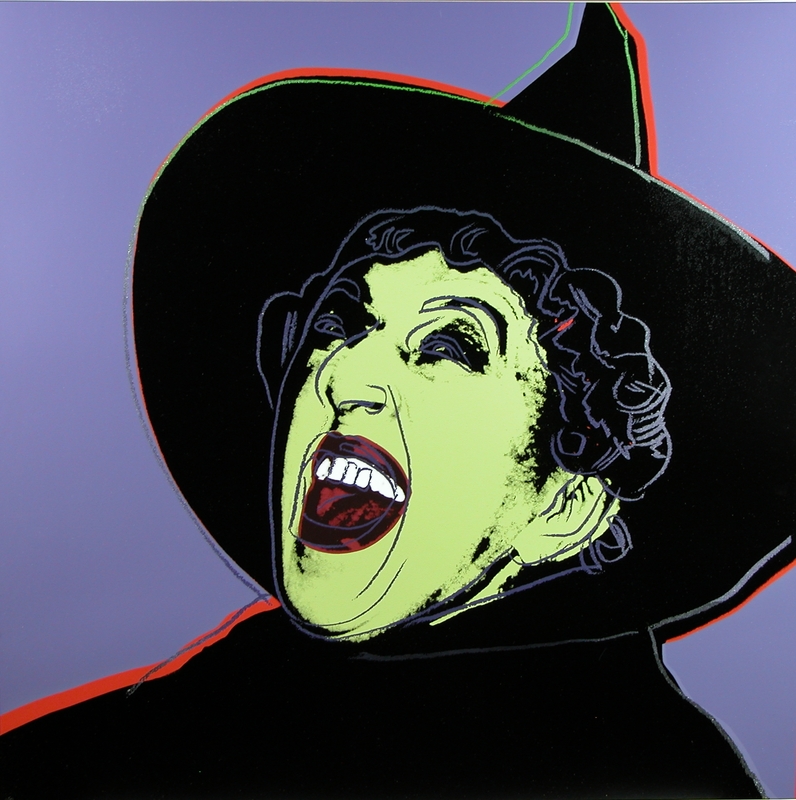 The piece of art in question is Andy Warhol’s witch print which I saw up close and personal on a recent visit to Dulwich Picture Gallery. Firstly decide how many colours you want to use (or you can can just use the choc in its natural white state). I wanted three colours, so I divided the bar into three. So far, so easy. For each colour, you need to break up the chocolate into pieces and drop into a bain-marie (that’s a heatproof bowl over a saucepan of simmering water, to you and me). 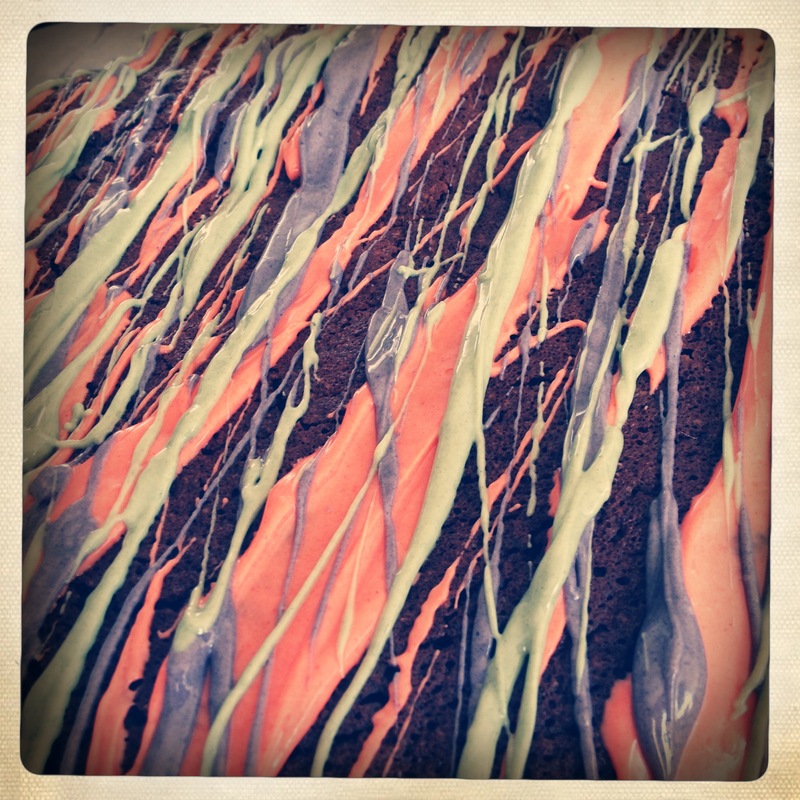 Once the chocolate is melted, you can add as much colouring as you like. The laws of chemistry mean that a water-based colour won’t mix with the chocolate very well. I used gel colours, but to get the best shades, tinting powder is probably the most effective. Once you’ve got your chosen shade, simply get a dollop of chocolate on a large spoon and drizzle over the cake. Obviously you’ll need to repeat this as many times as you’ve got colours. Once it’s completely set (bung it in the fridge to speed things up), cut into slices and scoff. 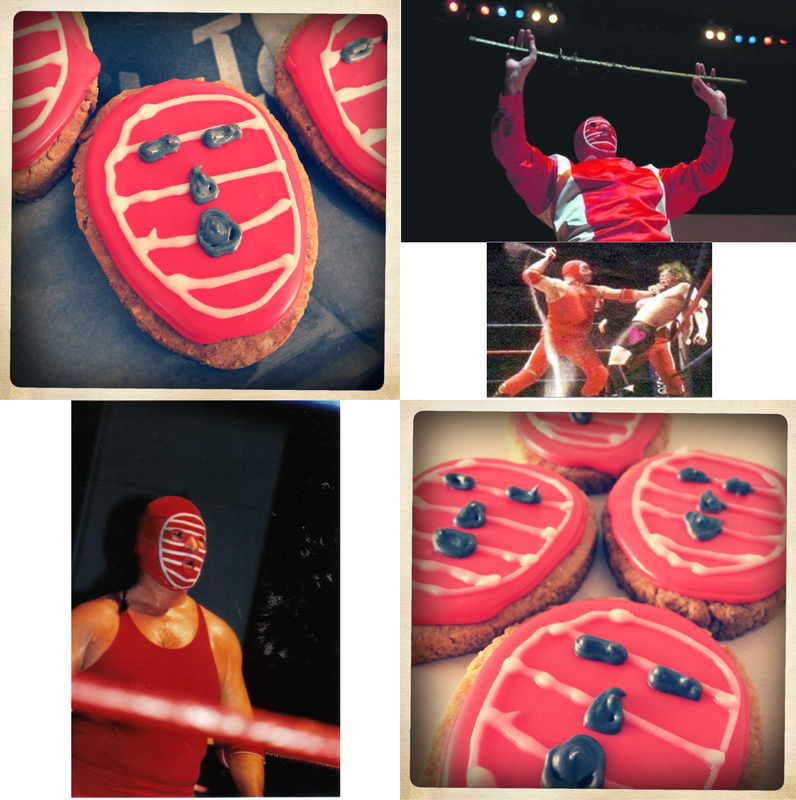 Last year I entered Bake & Destroy’s wrestling-themed Sugar Slam bake-off with the world’s first Kendo Nagasaki cake pops. This year? Kendo Nagasaki matcha biscuits. I’m referring to the British name for ‘cookies’ of course, not the rolls that our American cousins serve with gravy. You can call them cookies if you like. As someone who grew up with the British wrestling of the 1980s rather than the more flamboyant fighters from the US, the only distinguishable characters that stand out in my mind are Big Daddy, Giant Haystacks and Kendo Nagasaki. 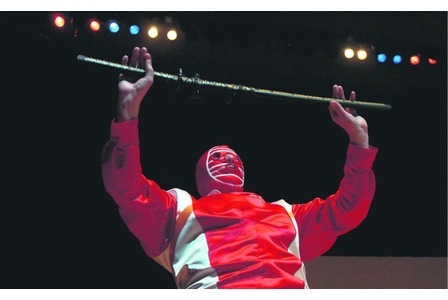 The latter (not to be confused with an American wrestler of the same name) rarely took off his mask, but one memorable bout saw him not only being stripped of his striped camouflage by his component, but also ‘hypnotising’ the offender with an intent stare and a wave of his hands. Entranced as we were at our young age, my brother and I still were still not entirely convinced by his magical powers. Sadly, ITV cancelled its wrestling coverage not long after that, quite possibly as a direct result of it. 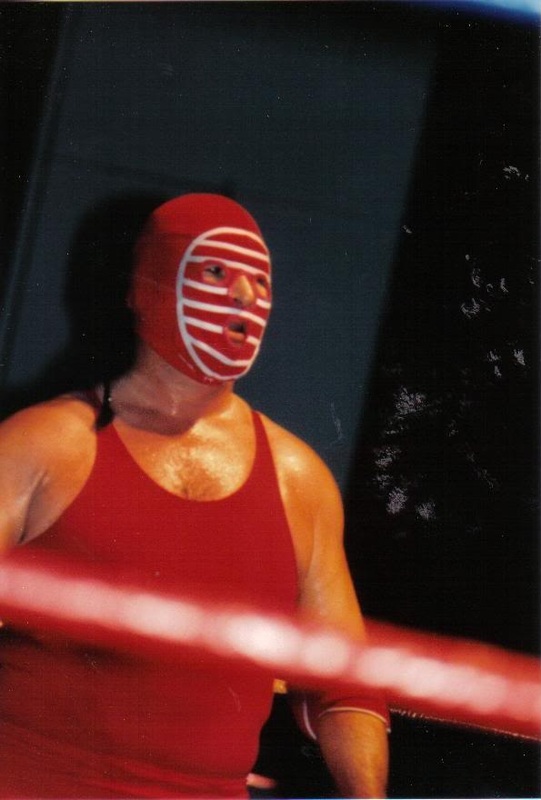 Despite his Japanese-inspired moniker and his Eastern mysticism, Kendo Nagasaki was in fact an English chap from the West Midlands called Peter Thornley. Which, in a roundabout way, brings me back to baking. This year, my entry for Sugar Slam is again inspired by the masked wrestler, with the quintessential English-ness of the plain biscuit representing Thornley and the matcha green tea flavour standing in for his mystical Japanese alter ego. I cannot believe I just wrote that sentence. Update: Voting for the Sugar Slam III People’s Choice Award is now open – if you like my biscuits, please head over to the gallery and leave a comment. Voting closes on 27 August at 9pm CST! Mix the flours and sugar together in a large mixing bowl. Add the butter and use your fingertips to blend it together with the dry mix until the mixture looks like fine breadcrumbs. Once mixed in, add the egg and syrup and mix together (at first with a wooden spoon, and then with your dainty hands) until a ball of dough is formed. Divide the dough in half and mould each into a flat disc before wrapping in clingfilm and bunging in the fridge for at least an hour. Preheat the oven to 170°C (150°C fan oven)/350°F/gas mark 4. Once chilled, unwrap the dough and pop it between two sheets of baking parchment and roll out to about 5mm thickness. Cut our your chosen shapes either using ready-made cutters or your own templates. To make your own, just draw or trace your design onto a piece of parchment and then stick this a spare piece of card and cut out. Stick the shapes on a lined baking tray, leaving plenty of room between each biscuit. Cook for 14 minutes or so (you may need more time, depending on your oven). The biccies are ready when they start to turn golden brown around the edges, at which point you need to take them out of the oven and transfer to a wire rack. Don’t even think about icing them before they’re completely cool otherwise the icing just won’t stick. Stick the water in a bowl and then using a fork to mix the icing sugar in. Once mixed together, you need to siphon off separate bowls for as many different colours as you’re planning to use. I saved a small bowl of white mixture for the stripes, plus a small amount to colour grey for the facial features and a small amount to colour red for the outlines. Take the outline colour ( in this case red) and pop into a disposable icing bag and snip the end to make a small hole. Pipe the outline around the edges of your biscuits, making sure that you join the ends up to create a tiny wall of icing. The remaining icing in the original bowl will be your flooding icing, which will need to be coloured to match the outline. Once done, spoon carefully into the middle of each biscuit and smooth out to the edges using a cocktail stick. Leave to dry. Using the same process as you used for the outline, you can use the remaining colours to pipe on the rest of the details. And then you’re done.